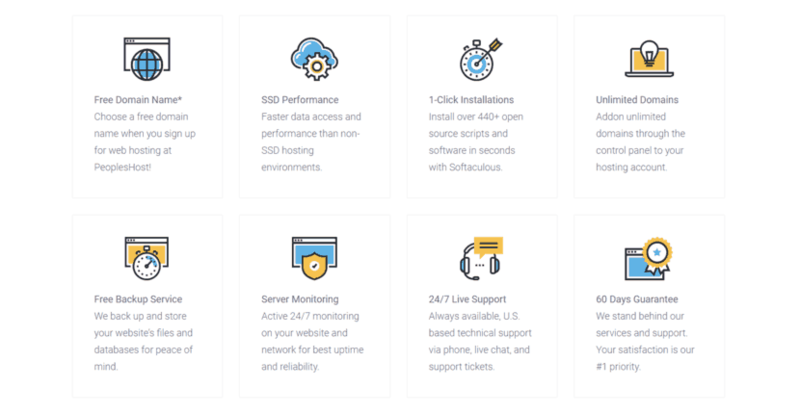 Peoples Host Review 2019: Is Peoples Host a Good Hosting? PeoplesHost is an American hosting service run by a team of seasoned experts with more than 10 years of experience in the industry. Their main objective is to hit a 100% customer satisfaction rate by delivering top-notch service and customer support along with their fully-redundant infrastructure. PeoplesHost is an American hosting agency founded in 2015 by a team with over a decade’s worth of experience in various large hosting companies. The company is based in the U.S. and has designed their entire business model around their mission to provide top-of-the-line service to all their customers. Their main focus is on the quality of service and support given to their clients. They own and operate their own Tier 4 data center located in Orlando, Florida. PeoplesHost offers both Windows and Linux for your choice of operating system. Their services include shared hosting, fully managed WordPress hosting, scalable business hosting, VPS hosting, and managed dedicated server solutions. Combined with a free one-year domain name registration and their CloudFlare CDN deployment for faster website loading speeds, this plan is a tempting offer for most users. In order to ensure they can deliver on their 99.9% uptime guarantee, the company doesn’t provide unlimited resources with any of their plans. What they do provide are free one-click installations of over 440 third-party software, a free website migration service, and automatic daily backups to make sure your data is safe at all times. Their Florida-based data center is completely redundant, so there’s very little chance that your website will go down with PeoplesHost. On top of that, the whole infrastructure undergoes 24/7 monitoring for safety and performance purposes. Managing your hosting account is easy with cPanel, even for inexperienced users. Beginners will also be happy to know that their packages include a free website builder. More advanced users also get FTP and SSH access. If you require more storage or bandwidth than the basic shared hosting plans, go for their scalable Business plans instead. These afford you a minimum of 50GB SSD storage along with unmetered monthly bandwidth, though the rest of the features are largely the same as those of their basic shared hosting packages. Businesses requiring enterprise-scale solutions should opt for their VPS or managed dedicated server solutions. I found PeoplesHost’s pricing scheme a little on the high side, particularly given that their entry-level shared hosting package comes with only 5GB SSD storage and 10GB monthly bandwidth — roughly the same as the entry-level plans of their bigger competitors. Features-wise, their offerings are similar as well. While they don’t stand out in the features department, where they really shine is in their commitment to customer satisfaction. While many bigger hosting providers would put profit margins and cost-cutting ahead of the individual customer, PeoplesHost was founded by a team of hosting veterans who wanted to change this trend. Operationally, this translates to fewer users per server, transparent pricing, better server reliability and uptime, and a support team that goes above and beyond to serve you. This is arguably what makes the higher price tag a worthwhile expenditure. There’s no free plan or trial for any of their hosting packages. There is, however, an industry-leading 60-day money back guarantee with a “no questions asked” policy – again reinforcing their commitment to customer satisfaction. Their U.S.-based support department is doing an excellent job to keep clients happy, though I think it’s a shame that their live chat is available only during business hours. However, there is a toll-free number available 24/7 for North American customers. For those who are not in a hurry, there’s also a ticket system that they respond to very quickly — but for the best tech support, make sure you’re logged in and submitting the ticket through your billing account. In case you need to migrate your website from a different host, tech support experts will help you do so free of charge. PeoplesHost may be a small and relatively new hosting operation, but it’s run by a team of professionals who seem to genuinely care about their customers. This is evident in the solid reputation they’ve carved out for themselves in such a short amount of time. Only one data center, located in the U.S. Wondering how Peoples Host stacks up against other Web Hosting companies? Enter any other Web Hosting company and we will give you a side-by-side comparison.